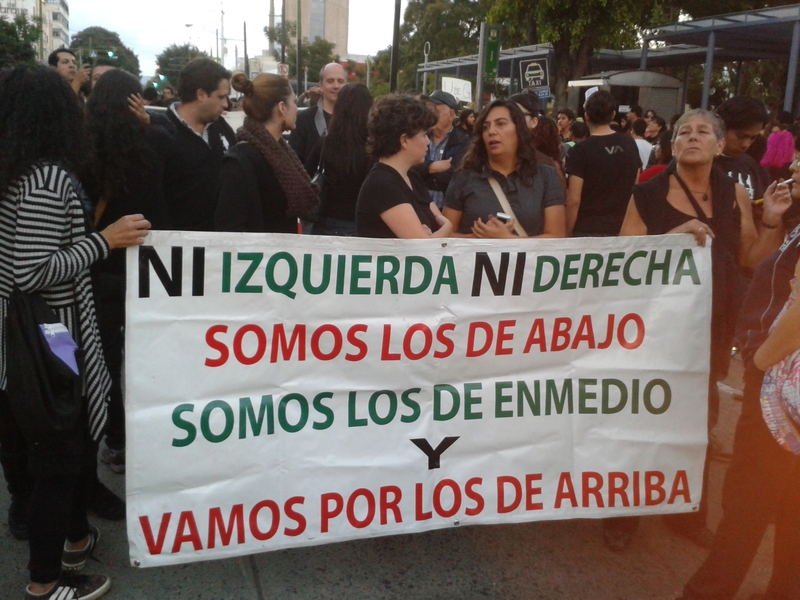 “Neither the left nor the right, we’re those from the bottom and the middle, and we’re coming for those at the top,” reads this banner from last night’s peaceful march in Guadalajara. What began with a few families demanding to know the whereabouts of their missing children has morphed into a national movement that threatens to bring down the president of Mexico. The nation has seen wave after wave of demonstrations since the disappearance of 43 students from a radical teacher-training college near the town of Iguala in the southern state of Guerrero in late September. The case has exposed the corruption that permeates much of Mexico, with prosecutors saying that the Iguala police force abducted the students and handed them over to a local drug gang under the orders of the mayor. Public anger has largely been directed at President Enrique Pena Nieto, whose government was slow to investigate the case but admitted a fortnight ago that the students were most likely massacred and their bodies burnt to ashes. Protesters burned an effigy of the president in Mexico City on Thursday night, as tens of thousands marched all across the country demanding justice and Pena Nieto’s resignation. Click here to read my interview with Father Solalinde in full over at The Independent.